Any gain or profit which arises in the course of the sale of a ‘capital asset’ is termed as a capital gain, this can be short term or long term capital gain depending on certain conditions. Except for few instances, generally, this gain is charged to tax in the particular previous year in which the capital asset is transferred. Capital assets include movable and immovable property such as Land, Building, and Investment in Shares, mutual funds, bonds and other financial instruments, house property, vehicles, jewelry, trademark, machinery, goodwill, patents, leasehold rights. Personal Effects i.e. Goods such as furniture, clothes, car, and watches etc. held for personal use. Any stock in trade, raw material or consumables held for the business or profession. A Rural Agricultural land situated in rural India. In general, there are two categories of capital assets, Long-term Capital Asset and, short-term Capital Asset; where any capital asset is held for a period less than 24 months (12 months for listed securities) is called a short-term capital asset. On the other hand, where any capital asset held for a period exceeding 24 months (12 months for listed securities) is called Long Term Capital Asset. 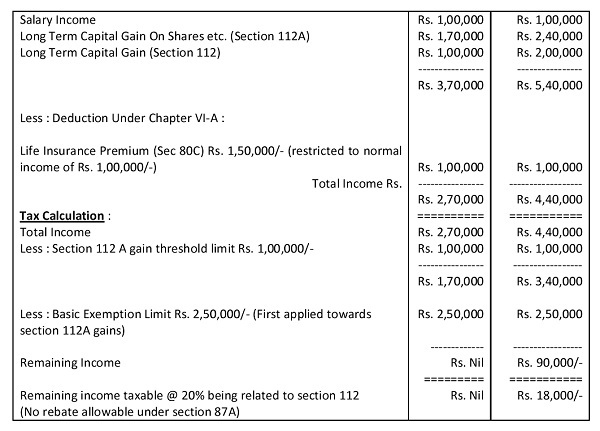 Under existing income tax laws transfer of a long-term capital asset (being listed equity shares or equity oriented mutual funds) on which Security Transaction Tax (STT) is paid on the transaction are exempt from the scope of Long-Term Capital Gain by the virtue of section 10(38) of the Indian Income Tax Act, 1961. However, Short Term Capital Gain from such shares and funds are taxable but at a lower rate of 15 percent (plus surcharge and cess) as per the virtue of section 111A of the said Act. However, the short-term capital loss arising on transfer of any capital asset can be set off against any other capital gain. For short-term capital gain also termed as STCG, the only cost of acquisition is allowed to deduct from the money received, whereas in case of Long Term Capital Gain i.e. LTCG the indexed cost of acquisition is to be deducted. An Agricultural land situated in India falls outside the purview of a capital asset and therefore, there will be no capital gains on transfer of such rural agricultural land. Taxability on Long-Term Capital Gain: The tax rate on Long-term capital gain is 20% + surcharge and education cess. Taxability on short-term capital gain arising on transfer of securities where security transaction tax is not applicable: Under this situation, the short-term capital gain will be added to the income tax return of the assessee and he/she will be taxed according to his/her income tax slab. Taxability of short-term capital gain if securities are transferred where security transaction tax is applicable: In this case, the short-term capital gain is taxable at the rate of 15% +surcharge and education cess. 516,096 total articles and counting.